Choosing an oven can be tough decision – the AGA and the conventional oven both have their place. Originally coal burning, the AGA was invented by the Nobel Prize-winning Swedish physicist Gustaf Dalén. After he was blinded in an explosion at work, he continued experimenting, trying to find an all-in-one cooker that would help his wife with the daily drudgery of traditional cooking and finally he came up with the AGA. The AGA functions as a constant heat source. The solid iron casting absorbs and retains heat and food is cooked via radiant heat rather than circulating hot air as in most conventional ovens. An AGA is a heat-storage stove as well as a cooker. The heavy cast-iron frame absorbs heat from a relatively low-intensity source. This heat is then transferred to the ovens and hotplates for baking, roasting and frying. A traditional Aga has no temperature controls as it’s left on continuously. AGAs have two hotplates, a burner, a simmering oven, a roasting oven, a baking oven, and a warming oven. Some of the newer, large AGAs even have a slow-cooking oven. No other oven in the world gives you food that tastes as good. An AGA cooks evenly and slowly and results in food, like casseroles, tasting heavenly. Because it’s always on, it’s always ready for use. An AGA becomes the focal point of your kitchen and home, always warm and welcoming. Your pets will love it too as they lie beside it during cold winter days, and the kitchen table’s the perfect spot for the children to read and do their homework while you cook the evening meal. You can use an AGA for drying clothes – fold your wet clothes, place them on the oven and when they’re dry they’ll look like they’ve been perfectly ironed. 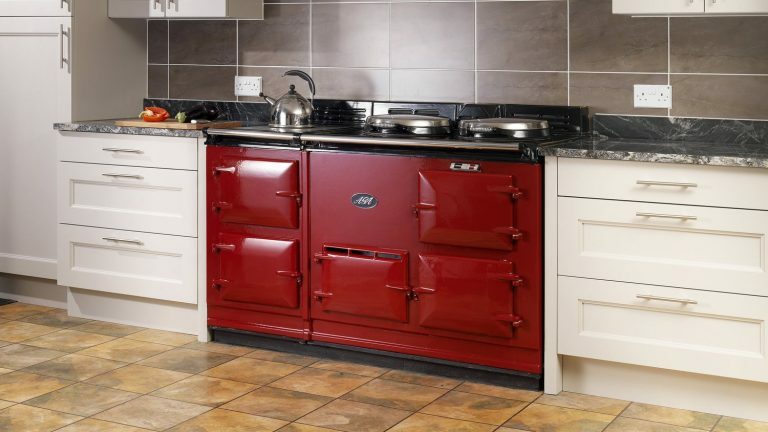 Many people buy an AGA simply because they look beautiful. They’re a luxury item and are recognised as chic and posh. Because an Aga is on all the time, you’re going to get big fat gas bills. But on the positive side, not only does an AGA warm your kitchen, it can heat your whole house. Modern AGAs have controllable features that will give you improved energy consumption. You’ll need a conventional oven in summer so you can turn the AGA off. Having it on during really hot days doesn’t make sense. AGA ovens are very expensive compared to conventional ovens – some can cost over £10,000 depending on the size and style. Conventional ovens are a simpler option for the novice, especially when using a cooking recipe – usually, the cooking or baking times suggested in a recipe are based on those of a conventional oven. Most modern ovens now come with a fan (convection ovens), and this has dramatically changed the cooking method. Food now tastes great when using them, and cakes and meats can be cooked to perfection. Conventional ovens don’t always bake evenly. The reason for this is that there’s little or no air circulation in a conventional oven – they rely on the heat from the walls of the oven to cook or bake. You can only roast or bake one or two things at a time in a conventional oven, but with an AGA you have the room to cook many dishes simultaneously. Cooking three meals at a time in an AGA is simple and once you’ve got used to this, using a conventional oven can be very limiting. Because you can’t cook as much, this normally means you have to spend a lot more time cooking. Owners of conventional ovens don’t enjoy having to cook two or three meals in a row when there’s other work to be done. Your cooking options are very limited as well. Using an AGA gives you flexibility – you can roast, cook, bake, pre-heat and more. If you are thinking of installing an Aga or indeed a conventional oven we can help you through the process and make sure you make the correct choice!